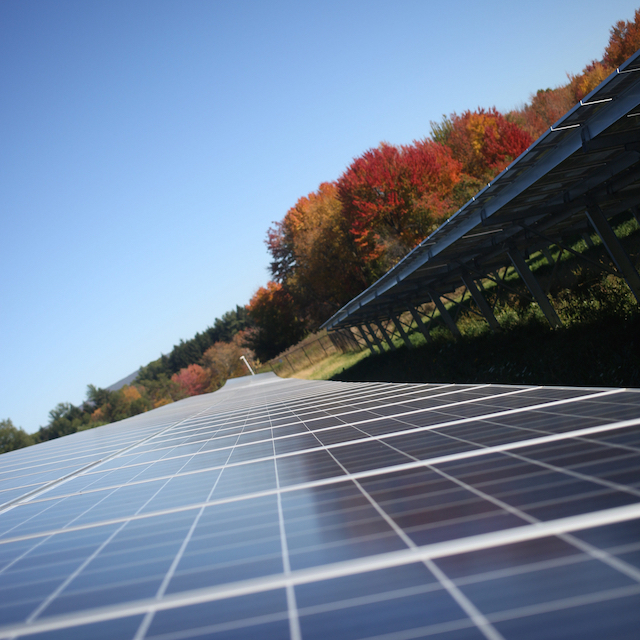 This solar array is part of the 19-acre solar energy system on the campus of Hampshire College in Amherst, Mass. Tesla Inc.'s solar business built the system and owns and operates it. Federal safety officials fined Tesla Inc. more than $110,000, the biggest safety fine in the company’s history, after an employee received a high-voltage electrical shock at a solar energy facility in Massachusetts. The Occupational Safety and Health Administration issued nine serious safety citations against Tesla last month, with fines totaling $110,863. The citations stem from an injury to a Tesla employee working on a solar energy project at Hampshire College in Amherst, Massachusetts. The employee suffered electrical shock and burn injuries Dec. 29 when he entered an electrical panel — energized at 13,800 volts — to take pictures of the equipment with his cellphone after construction was completed, according to an OSHA spokesman. The employee was taken to a local hospital, where he was treated and released, a college spokesman said. Tesla owns and operates a 19-acre solar power system on the Hampshire College campus, providing electricity at a fixed rate to the private liberal arts school. The project was built by SolarCity, which Tesla acquired in 2016. Federal regulators found that Tesla failed to provide workers with adequate training or protective gear. Employees did training courses online, but Tesla didn’t have a proficiency requirement to make sure they were using equipment properly, one citation stated. Workers couldn’t explain the correct distances to stay away from energized equipment, another citation said. Four employees working on the solar installation, which has equipment energized at up to 13,800 volts, had been given gloves with a maximum voltage rating of 1,000, regulators found. And Tesla didn’t conduct required inspections of its safety procedures, a citation said. A statement provided by Tesla said the citations are not appropriate and the company will appeal. Tesla has had other electrical injuries at its car manufacturing plant in Fremont, California, however. On June 5, a contractor suffered second- and third-degree burns to his face, chest, arms and hands from an electrical explosion called an arc flash. It threw him back 15 to 20 feet and set his clothes on fire, according to records from the state’s Division of Occupational Safety and Health. The electrician trainee was not qualified to be working on the equipment without supervision and didn’t have adequate protective gear, investigators found. The company he worked for, Mark III Construction, was fined $52,800. Tesla wasn’t cited in that case. But it was cited for an arc flash that occurred in 2014 at the Fremont factory, when an employee was cleaning inside an energized high-voltage electrical panel. The employee was burned on his arms, shoulder, back and face and lost consciousness when he was thrown to the ground. In that case, a $70,000 fine later was reduced to $40,400. A Reveal investigation last month found systemic safety problems at Tesla’s Fremont factory. Former Tesla health and safety officials told Reveal that the company prioritized production over safety and failed to adequately train employees. Reveal also found the company undercounted injuries, making its safety record appear better than it actually is. California’s workplace safety agency opened two investigations at the plant last month — one the day after Reveal’s investigation published and another after a contractor was struck by a piece of equipment and suffered a broken jaw April 9. California safety officials have cited Tesla for more than 40 violations since 2013. The Massachusetts fine is the biggest safety-related fine for Tesla yet. The $110,000 fine is higher than any levied against SolarCity before the Tesla acquisition and larger than any against competitors Sunrun, SunPower and Trinity Solar, according to a review of OSHA records by Reveal. Another competitor, Vivint Solar, received a $136,708 fine in November. OSHA also fined Vivint Solar $126,749 in February 2017, but it was reduced to $50,000. Tesla is allowed to dispute the citations and potentially negotiate a lower fine. An informal conference between Tesla and federal regulators is scheduled for May 10. The incident won’t disrupt Tesla’s 20-year contract with Hampshire College, said spokesman John Courtmanche.